During my early years as a Catholic school student, I remember our teachers setting aside time in class for us to tune into episodes of Davey and Goliath. First off, I have to admit, watching TV in class had to be one of my most favorite things. Talk about a low-stress activity! No reading. No writing. No being called on. It was truly awesome. TV in school! Davey and Goliath was produced by the Lutheran Church in America--now part of the Evangelic Lutheran Church. I guess it was the Christian message that attracted our teachers, which was fine with me. Hell, it didn't matter to me, I'd watch Shalom Sesame (the Hebrew school friendly versions of Sesame Street they showed on PBS around Passover) with gusto over doing those damn times table races with Mrs. O'Toole. I know many of you FourthGradeNothing.com followers were born in the 1980s and 1990s, so before you comment with, "Davey and Go-who? Whattt? Never heard of 'em!" Chillax, I'm about to fill you in. I spent an hour searching YouTube but all I could find were Davey and Goliath Mountain Dew ads and spoofs, so sadly, I'm unable to include a clip. Davey and Goliath was a 1960s religious clay animation or claymation television series produced by Art Clokey for the Lutheran Church for $1 million. Art Clokey had a successful run with the Gumby series -- stop motion animation was popular at the time... Remember the Rudolph holiday programs? Same idea. Targeted to young viewers, each episode lasted about 15-minutes and provided a lesson in sharing, caring, loving thy neighbor and placing your trust in God. 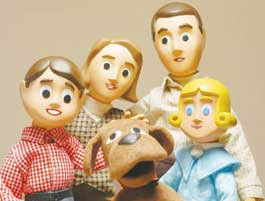 The show focused around Davey Hansen, his adorable wingman/talking pup Goliath (only viewers and Davey could hear him speak), his parents, blond-haired sister Sally and various friends. I'm far from religious today, but still have a soft spot for the show. I used to love the organ and horn theme song, "A Mighty Fortress Is Our God" -- if I had thought of it sooner, I could have used it at our wedding. I was desperate for religious sounding music two years ago. It would have been awesome to see if anyone recognized it and hey my husband was raised Lutheran. I have seen this show! Not when I was a kid though. A couple of years ago on one of the Christian cable channels they had this show on. I thought it was incredibly cute. Never saw the show but I am a fan of gumby. I had a gumby stretch doll. One million? Crazy budget for then. I used to love that show. Though I am jealous that you guys got to watch in class. I wished they would've shown it in my hebrew school. Oh Oh! See me? I'm the kid with the hand up, waving and being generally annoying. I remember this show! I watched it! Thanks for reminding me! I've never seen the show or maybe I have but I have a pretty crappy memory when it comes to that kind of stuff but I do still watch the old Rudolph and have it on DVD so I get the idea...$1 million dollars was a lot of money in the day though so WOW! I have to say I am so glad you found me and in turn I found you! ;-) Good Stuff!! It's funny what things from our childhoods hold memories for us. My husband loves anything that's claymation. He just doesn't understand why he's the only one in the house who feels that way. haha thats cool thanks for sharing. i wonder if they would have any vids on gaggle.com since its the christian version of you tube. that would be cool. Thanks for stopping by my blog today. I have visited yours a few times and I made sure I was following yours today. I like to read your cause even though you grew up in a different decade there is a lot fo things that were the same and it just makes me think. My memory aint as good as yours though. Oh how I remember, and also loved Davey and Goliath. I am Lutheran and attended Lutheran K - 8 so I am fairly well versed in children's shows with good messages.....Here's one for you. Did you ever watch "McGee and Me"? (It was like the Christian precursor to Disney's Lizzy McGuire.) It was my personal favorite when I was tiny...I stumbled on an airing of it last week, oh I was a kid with poor taste. PS, I awarded your blog, you should stop by and check it out. My Jewish sibs and I loved sharing our mornings with Day-vee (said by Goliath as 2 compeltely distinct syllables). That is, we loved it until all the Jesus talk Mom and Dad imparted in the end. Then it was time for some raucous dreidle games. I totally forgot about this show but used to watch it- I had not idea is was religious. Can't even remember what it was about- Nice. I'm Ren a fellow nominee from Traveling Fish. I LOVED Davy and Goliath. And the minute I saw your post that wondrous tune started in my head. My sister found the claymation creepy. I adored everything about it. We are Catholic and it used to come on on Sunday mornings, as we were getting ready for church. I always hurried so I could watch it. Thanks for the memory. I have never even heard of this show but now I know where adult swim got 'Moral Orel'..it must be a spoof of Davey and Goliath. I LOVED this show! Of course going to a Catholic school we watched it to, but I watched it myself when it was on t.v.! Goliath's deep and slow "Hey Davey" always made me giggle. Awesome post! You know what else is awesome? That I am your top commenter! I love it! 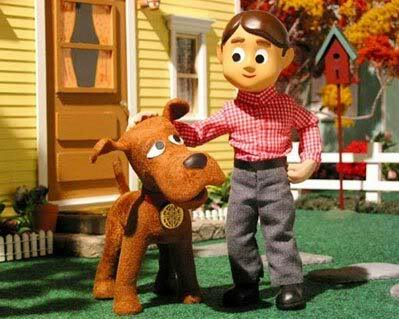 I adored Davey and Goliath when I was a kid. I'd walk around talking like Goliath all day long annoying the heck out of everyone. I loved that show! I have an old VHS tape of Gumby and Pokey, I didn't know it was made by the same guy but they do look alike. My son used to watch it (Gumby and Pokey) when he was a kid. He has been trying to find a DVD or a place to download episodes so he can share it with his friends, however, he hasn't been able to find it. I totally watched this show every Sunday morning, particularly around on Easter Sundays, when my brother and I would be up bright and early to attack our Easter baskets. I think it was followed by Simon in the Land of Chalk Drawings -- "I know my name is Simon, and the things I draw come true" -- silly theme song stuck in my head now. I actually watch that cartoon. I remember watching this and liking it until all the religious stuff at the end because it sounded really silly to me. (I finally learned the word "atheist" in high school.) My family was "Christmas tree Christians", we celebrated Christmas, but were not church goes and never discussed religion (both my parents had bad experiences with religion as kids). My mother took my sister and I to the church her aunt and cousin sang in the choir at on Christmas eve, but that was it, so I think this show and my neighborhood friend who went to Catholic school were how I learned what little I knew about Christianity until college history courses that had to touch on it to explain much of European history.